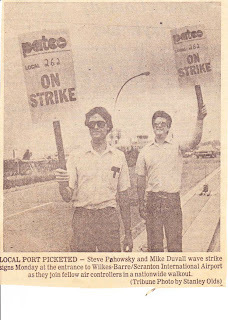 This week I heard from Steve Pohowsky, a former member of PATCO local 262 at Wilkes-Barre/Scranton International Airport in Pennsylvania who lost his job for striking in 1981. He is pictured at left with fellow striker Mike Duvall. Steve's story is particularly interesting because he had been on the job for less than a year when he struck. As he told me, he "spent more time with the other controllers on the picket line than I did in the tower." 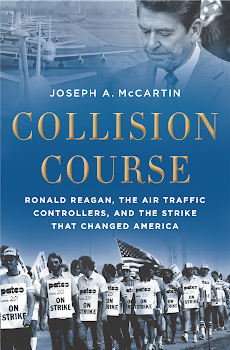 Thank you so much for writing an absolutely wonderful book on the Air Traffic Controller strike of 1981. I had always hoped that someone would write a fair book about this watershed event in labor history. I was one of the controllers fired by the President. Reading your book brought back many of the emotions I felt during that time period. I’ll admit my eyes went misty reading the last two chapters because I lived through all you wrote. I related to all the former controllers you mentioned. This was part of my past I tried to bury. Thank you for reminding me where some of my current independence and strong will came from. Wilkes-Barre Scranton Airport. Union membership started sometime in the early summer of 1981 in order to get group rates for health insurance as well as legal protection in case something happens. I had completed check-out in the ground controller position and was just about finished with tower certification when the strike occurred. 17 of 18 controllers went on strike and I went with them. I reasoned it the right thing to do and the cause seemed right. I wrote several passionate letters to the newspaper. We never thought we would lose our jobs for life. The mistake Reagan made as I see it was to react too quickly. He should have waited a week or two before responding. An uncle of mine was the union steward for the postal workers and he told me the post office was planning to strike too until they saw what happened to us. He believes we were scape goats to prevent the postal strike. One replacement controller at the tower I knew from the Air Force. We took the Civil Service test together for Air Traffic Controller. I aced the test and he flunked with a score of 62. The FAA lowered the cut off to get anybody in. Prior to entering the Air Force I had completed a 2 year Associate Degree in Electrical Engineering. 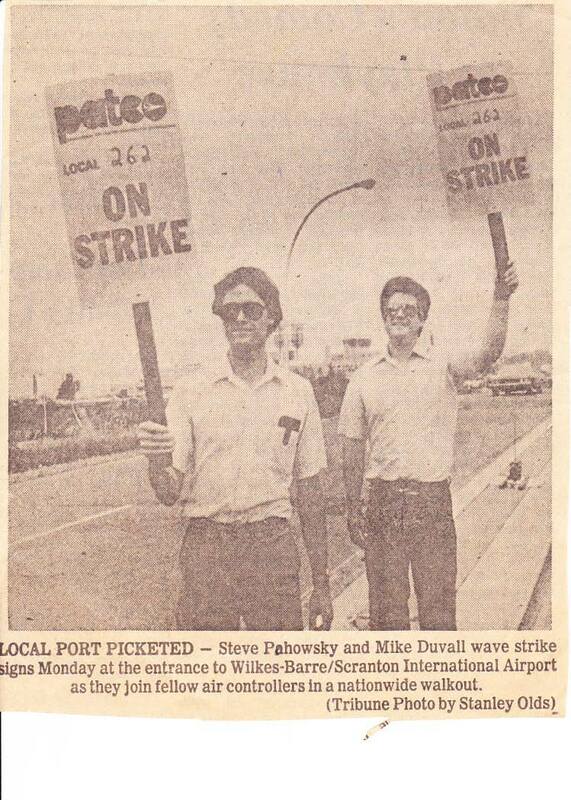 Six months after the strike I was able to get a job at Western Electric in Allentown, PA. I was so sorry for most of the controllers who had nothing else to fall back on. That degree saved me and I went on to a 22 year career in semi-conductor manufacturing, that is until they moved it all overseas. Now I work for the State Government ironically as a Traffic Control Specialist. I experienced the black balling you described when during a job I applied for with IBM I was rejected because I participated in the strike. Even at Western Electric they were reluctant to hire me because they thought we’d all be called back to the FAA. There never has been a doubt in my mind that our cause, although somewhat misguided, was just. We stood up for what we thought was right and paid a terrible price.